In 1970, a team led by French ocean explorer Jacques Cousteau recovered an unusual stalactite from the depths of the famous Blue Hole in the Caribbean Sea. In the current issue of the “Journal of Sedimentary Research”, geoscientist Eberhard Gischler of Goethe University Frankfurt explains what it reveals about our climate since the last ice age. At the time, Jacques Cousteau’s divers did not find any visible traces of living organisms in the mysterious Blue Hole. They did, however, find a large number of stalactites such as are known from karst caves. These are formed through the dissolution of limestone. Today the 125-metre-deep Blue Hole off the coast of Belize is flooded by the sea. Frankfurt geoscientist Eberhard Gischler has been researching in Belize for over 25 years. He was given the unusual sample two years ago by Professor Robert Ginsburg at the University of Miami, with whom he worked in the 1990s as a postdoctoral researcher. Robert Ginsburg had in turn been given the stalactite by Jacques Cousteau immediately after it was found. Back then, he had the sample sawn into pieces and began to examine it together with marine geologist Bob Dill. Work did not, however, progress beyond a preliminary analysis. Added to this, the largest pieces of the stalactite went missing when the Ginsburg laboratory moved premises. The cross section now being examined is the last specimen from Cousteau’s stalactite. After almost 50 years, when the Blue Hole stalactite was in danger of being forgotten, Gischler, together with physicists from Goethe University Frankfurt and colleagues from the universities of Mainz, Hamburg and El Paso (USA) as well as GEOMAR in Kiel, has unveiled its secret. By contrast to most stalactites, the outer layers of the Blue Hole stalactite are composed of marine deposits. Its concentric layers allow a detailed reconstruction of the climate in the late Pleistocene and the Holocene (the period from about 20,000 years ago to the present day). For example, the core formed during freshwater influx indicates surprisingly dry conditions during the Last Glacial Maximum and the following period (approximately 20,000 to 12,000 years before our time). The marine layers formed when the karst cave and the stalactite were flooded after the ice age by rising sea levels, i.e. over the last 11,000 years. “Detailed climate reconstruction is, however, rendered difficult by the fact that the stalactite layers formed both on land as well as in seawater developed under the influence of microbial activity,” explains Eberhard Gischler. The researchers are now decoding the types of microbial activity that influenced calcium precipitation during the stalactite’s formation. On the basis of this study, it will be possible in future to make better use of the potential that stalactites with a complex formation history offer for the reconstruction of paleo-environmental conditions. Together with doctoral researcher Dominik Schmitt, Gischler is currently working on other deposits in the shape of sediment drill cores up to 9 metres long, which were extracted from the floor of the Blue Hole in August. The sludge-like bottom sediment from the Blue Hole shows fine annual layering and will be used as a high-resolution storm and climate archive. Shown in the picture is a cross section of the remarkable “Cousteau Stalactite”, which was originally 2.84 metres long and weighed about a ton. It can meanwhile be found at the Department of Geosciences of Goethe University Frankfurt. 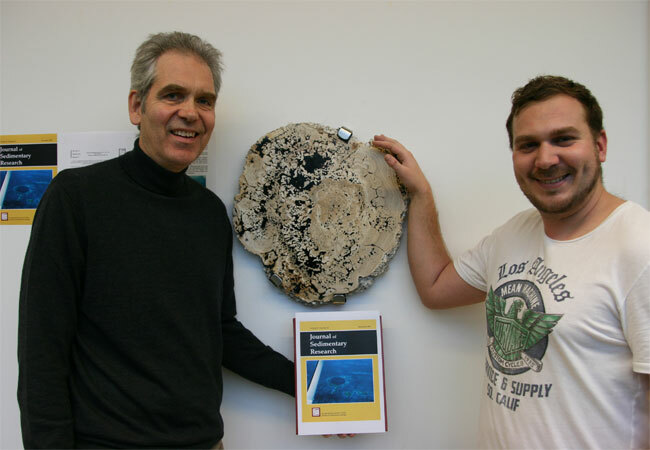 Caption: Professor Eberhard Gischler and his doctoral researcher Dominik Schmitt with the last piece of the stalactite recovered from the Blue Hole by Jacques Cousteau in 1970. Photo: Daniel Parwareschnia. Publication: E. Gischler et al. : A giant underwater, encrusted stalactite from the Blue Hole, Lighthouse Reef, Belize, revisited: A complex history of biologically induced carbonite accretion under changing meteoric and marine conditions, in Journal of Sedimentary Research, 2017, Vol. 87, 1260-1284. Further information: Professor Dr. Eberhard Gischler, Department of Geosciences, Faculty of Geosciences and Geography, Riedberg Campus, Tel. : +49(0)69-798-40183, gischler@em.uni-frankfurt.de.